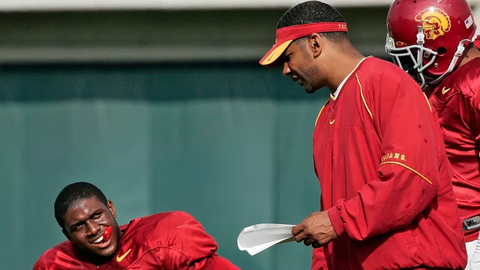 LOS ANGELES (AP) — Jurors in Los Angeles have found the NCAA did not defame former USC assistant coach Todd McNair over a case linked to the misdeeds involving Reggie Bush. The jury voted 9-3 on Monday against McNair on the third of nine questions on the verdict form: Whether statements the NCAA infractions committee and appeals committee made about McNair were false, according to the Los Angeles Times. McNair sued the NCAA in June 2011, claiming the association’s investigation was one-sided and his future earnings were hurt by its report on the scandal, which led to sanctions against USC. The NCAA determined McNair lied about knowing about some of the gifts lavished on Bush’s family by two aspiring sports marketers who hoped to land the future NFL player as a client. The Heisman Trophy-winning Bush later had his Heisman victory vacated. The NCAA imposed a two-year bowl ban and scholarship restrictions on USC as a result of the Bush case. McNair was prohibited from contacting recruits and his USC contract was not renewed. McNair claimed the NCAA’s infractions committee and appeals committee libeled him in their final reports by printing information they knew to be false. He also accused NCAA President Mark Emmert of slander for telling USA Today in December 2010 the infractions committee “got it right, I think” in the Bush case, according to the LA Times. Over the course of the trial, McNair’s attorney Bruce Broillet accused the infractions committee of changing key evidence related to McNair in order to connect the coach to the Bush scandal and increase sanctions against USC, the LA Times reported. In closing arguments, Broillet asked the jury for $27 million in damages.